Pure, crystalline solids have a characteristic melting point, the temperature at which the solid melts to become a liquid. The transition between the solid and the liquid is so sharp for small samples of a pure substance that melting points can be measured to 0.1oC. The melting point of solid oxygen, for example, is -218.4oC. Liquids have a characteristic temperature at which they turn into solids, known as their freezing point. In theory, the melting point of a solid should be the same as the freezing point of the liquid. In practice, small differences between these quantities can be observed. It is difficult, if not impossible, to heat a solid above its melting point because the heat that enters the solid at its melting point is used to convert the solid into a liquid. It is possible, however, to cool some liquids to temperatures below their freezing points without forming a solid. When this is done, the liquid is said to be supercooled. 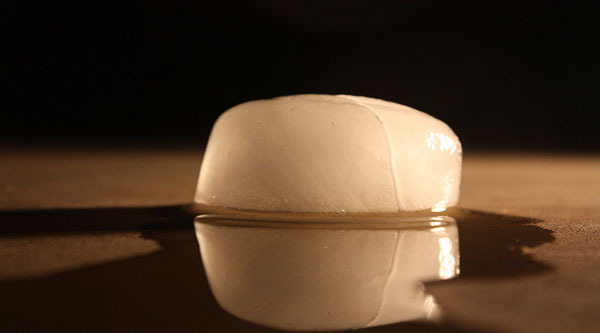 An example of a supercooled liquid can be made by heating solid sodium acetate trihydrate (NaCH3CO2 3 H2O). When this solid melts, the sodium acetate dissolves in the water that was trapped in the crystal to form a solution. When the solution cools to room temperature, it should solidify. But it often doesn't. If a small crystal of sodium acetate trihydrate is added to the liquid, however, the contents of the flask solidify within seconds. A liquid can become supercooled because the particles in a solid are packed in a regular structure that is characteristic of that particular substance. Some of these solids form very easily; others do not. Some need a particle of dust, or a seed crystal, to act as a site on which the crystal can grow. In order to form crystals of sodium acetate trihydrate, Na+ ions, CH3CO2- ions, and water molecules must come together in the proper orientation. It is difficult for these particles to organize themselves, but a seed crystal can provide the framework on which the proper arrangement of ions and water molecules can grow. Because it is difficult to heat solids to temperatures above their melting points, and because pure solids tend to melt over a very small temperature range, melting points are often used to help identify compounds. We can distinguish between the three sugars known as glucose (MP = 150oC), fructose (MP = 103-105oC), and sucrose (MP = 185-186oC), for example, by determining the melting point of a small sample.